Tomorrow, the official start of my competition (skier cross) season begins, and the rest of the season promises to be no less then crazy. Mt. Hood Meadows is holding the first Nor-am (North american cup) out of the 4 in the circuit. So, The race for the overall title begins. Even if/when the freezing level is at 8,000 feet with 100% chance of precip. Skier cross is the Motocross of the snowsport world. The course is filled with jumps, bumps, turns, rolling terrain, and plenty of speed thrown in. 99.99% of the time there are 4 racers competing at once with the top two moving on each round until the winner remains. As the saying go's, "rubbing is racing" and in the sport of skier cross there is plenty of contact. Which keeps it interesting for spectaters and more so for the competitors. It's definately the most action packed, high paced event on snow. 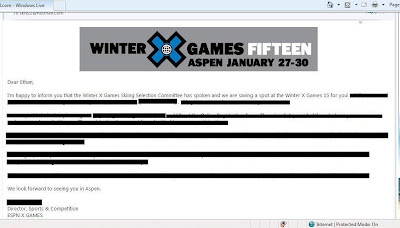 I recently received my first invite to ESPN's Winter X Games! Being 20 years old and hearing that news got me... pretty excited to say the least. Remember me saying how 99.99% there were four racers on the course at once? well that .01% exception is X games. When it comes to X games, the men and women at ESPN decided to spice it up a bit more by throwing 6 competitors down a course at anywhere from 35-55 mph at a time. So, a day after I get back home from Hood, I'm taking a little road trip to Aspen, Co. where I'll spend 4 days ripping down what will prove to be one of the most interesting yet challenging courses that I have competed on with names like Daron Ralves (the most decorated Downhill racer in the history of the US ski team), Casey Pucket (former US Ski Team member, with multiple olympic appearances), and John Teller (the current World Cup leader for the sport). With all these guys being right around 200-220 lbs, I'm definately not going to be able to rely soley on my 165 lbs but heavily on tactics and skill... and the magic that the Swix Tuning Techs can make happen (as far as fast skis go). Well I am banking on it. Ethan Fortney, you are my HERO!!!! Wishing you the best of luck with the dirty hotel rooms....oh yeah and the races!